I am looking out my window today as the snow continues to fall and cover nearly everything in white. How lovely it is and, by delaying my work day, it is providing me time to pause to remember how I came to adopt the beautiful Kendal, a 1967 blonde NP. 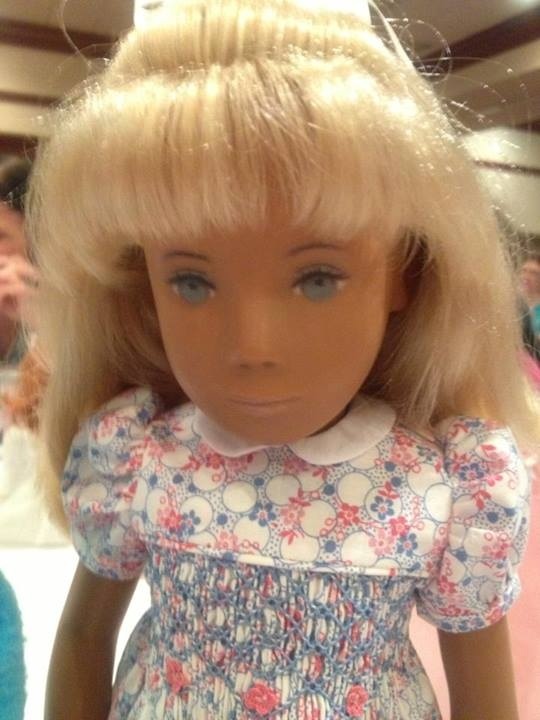 This lovely doll was listed for sale by Nancy Miller on her website ” Let’s Play Dolls”. Nancy wrote an excellent description and provided many photos of this girl. The next two photos are Nancy’s photos and I asked her permission to post them here for this sole purpose. She kindly gave permission and you can see how lovely this Sasha is and her condition was nearly mint. When I saw the photos and decided to try to adopt her, I contacted Nancy. I made the leap and bought her and can still recall her arrival and my heart racing with excitement. She was my first blonde NP girl with eye lashes!!! 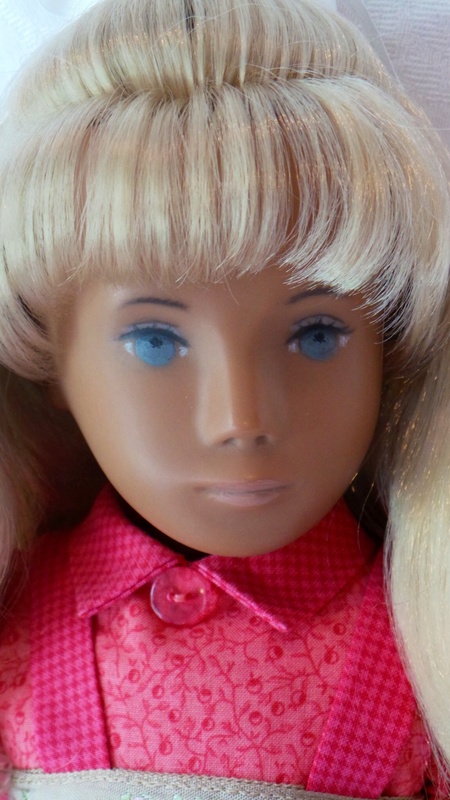 As described in an ealier post, Carney was the first blonde NP girl in my collection and she was made in 1966. Carney has beautiful big eyes with no lashes. This sweet girl looks very different from Carney and I carefully removed her from her expert packaging. I could only stare at her for many days. She was perfection to me and I was a bit intimidated at first to touch her hair or clothing. During my early “stare only” period, I was waiting for this NP to whisper her name to me and she did and it was certain to be “Kendal”. I have loved the name Kendal and heard it first from our very own, well known Sasha collector and Sasha blog writer, Kendal Hackney. I wrote Kendal to ask if she thought that was a good name for her and she did!!! So, this beautiful NP was named Kendal. After naming her, I found it much easier to handle her and began to redress her. I carefully stored her original brown corduroy outfit for later. I dressed her in Ruth’s doll baby blue corduroy outfit first which looks so nice with her blue eyes and coloring. These photos were taken last year when the lilac was blooming. A close up of Kendal and I think we were both a bit shy at first. This pretty dress and pinny were made by Nikita and her shoes and socks are by Ruth’s dolls. I particularly like the length of this dress. I was very fortunate to attend the 2012 Sasha Festival in Cincinnati, Ohio. I took Finn and Kendal with me and here they are in the hotel room, the hotel lobby, and the last photo is Kendal wearing a favorite smocked dress made by Karen Warnaka. Kendal also modeled clothing on Lorraine’s sales table. It was a beautiful white studio dress that Lorraine created. I was not able to locate that photo of Kendal. Kendal is happy to wear this special smocked dress made by Joan Wilson. I love the tiny beads in the smocking and have loved Raggedy Ann dolls since I was a toddler. In fact, Raggedy Ann was my first doll. The last photos of Kendal were recently taken of her new, soft corduroy dress made by Nadia. Her socks and shoes are by Ruth’s dolls. Kendal is particularly lovely in short dresses. I think that may be true because she is very petite (not quite 16 inches tall) and the shorter length is more becoming. I love her sweet expression and pretty face. Kendal is a jewel in our Sasha family at Sasha Shangri-La. I hope to show more photos of her dressed in play wear soon. I would like to introduce a few more Sashas too. Thanks to everyone for visiting and hugs from me and Kendal to you. Kendal is a true beauty. Her eyes beautiful and bright, not all np girl have this bright eyed look so when you see one it is all the more memorable. She looks lovely in all her dresses but especially in the smocked ones. Kendal is beautiful Ginger, it is my dream to one day own an NP and if i am lucky enough to find one half as beautiful as Kendal, i will be very lucky. I loved meeting you and Kendal at the Festival! Kendal is a very special girl, it’s wonderful to read more about her. Her Raggedy Ann dress is so lovely. Raggedy Ann and Andy were my first dolls too. I still have and adore them. You really do have some lovely dolls in your collection and it’s such a pleasure seeing them here on your blog! Hopefully second time round that I’ll be lucky and manage to actually publish this. What an absolutely gorgeous doll your Kendal is. 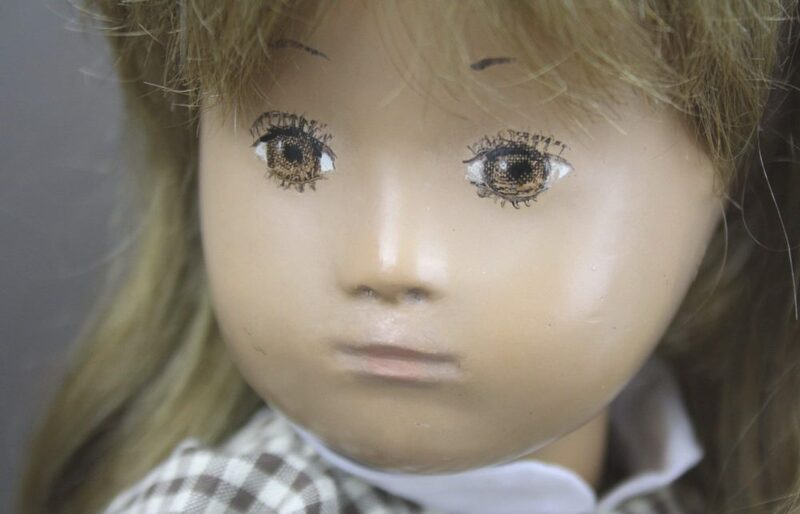 I do remember seeing her and a few other beautiful dolls for sale on Nancy Miller’s website a couple of years ago. I love how you have added this little ‘take’ on your blog posts by introducing your dolls and showing them wearing their different outfits. I admire individuality in things. My favourite outfit this week has to be the Joan Wilson Raggity-Anne dress as the rag doll scenes around the bottom of the skirt are most unusual. The smocked Karen Warnaka and Ruthsdoll’s dresses really enhance the blue of her eyes. So very nice for you to send your comments again Kendal, thank you!!! I think their legs are beautifully shaped too. As a child, my dresses were shorter rather than longer and it helped play time a lot, especially tree climbing :).